Dig Dug II is one of Namco's more obscure games. It takes the characters from the original Dig Dug, and places them in a new environment. The action no longer takes place underground, but instead on top of small islands. The islands are usually larger than the width of the screen, so the action scrolls horizontally. It runs on Namco's Super Pac-Man hardware (two Motorola M6809 microprocessors running at 1.536 MHz), but with a video system like Mappy, The Tower of Druaga and Grobda (minus the DAC). Once again, Dig Dug must rid this world of Pookas and Fygars. This time he has two weapons at his immediate disposal. He still has his trusty pump which can be used to fill enemies with air until they pop. But he also has a jackhammer, which can be used to weaken faults on the island and create cracks along the ground. When a section of the island is completely separated by cracks the smaller component of the island falls off into the sea, taking any enemy on its surface with it. If Dig Dug does not plan it out carefully, he could end up drowning as a result of his own jackhammering. Dig Dug II never came close to the level of popularity that the first Dig Dug enjoyed. It was ported to both the Family Computer Disk System and the U.S. NES, and it was ported very successfully. It retained every feature of the arcade game, and more than doubled the number of distinct levels from 32 to 72. Later NES levels were decorated with different themes besides islands, such as a volcano. After the Nintendo DS launched, Namco released Dig Dug: Digging Strike - that bridged the two Dig Dug games together, as well as cemented Dig Dug's relationship to Mr. Driller (one of Namco's last video games of the 1990s). Dig Dug is on the job once again. Several islands have been infested with Pookas and Fygars and Dig Dug must get rid of them... even if it means demolishing half of the island. Whether he pumps the enemies or sinks them in the sea, Dig Dug must hop from one island to the next exterminating the nuisances. The islands vary in size and shape, and are sometimes even made to look like capitalized letters. 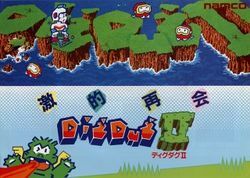 The player must direct Dig Dug (real name: Taizo Hori) around each island with the four-directional joystick. Use the first button to activate the original air pump, and the second button to activate the new jackhammer. You must kill every Pooka and Fygar on the island to advance to the next round by exploding or sinking them. You must avoid contact with every Pooka and Fygar on the island, as well as their ghosts, and a Fygar's fire. Use your pump to blow up enemies. Enemies that don't pop begin to deflate. They are safe to pass through. Use the jackhammer to create cracks in the ground from the pegs in the ground. The enemies cannot pass. A separated section of island will fall in to the water, taking enemies, (and possibly Dig Dug himself), with it. This page was last edited on 2 April 2016, at 01:29.